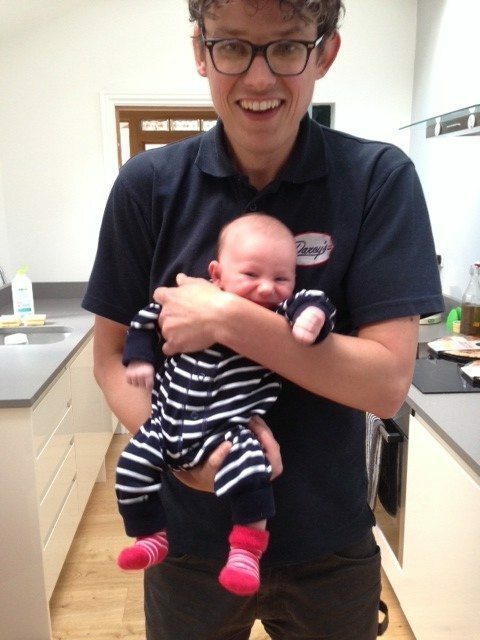 Many of the garage customers know that in July the wonderful and lively baby Dillon Ray Darcy arrived into our world !. Having a baby makes it difficult to do lots of things, and writing about the garage is definitly one of them ! He’s now 9 weeks old, smiling and doing lots of other good stuff so its all pretty exciting. I get lots of good advice from customers about having a baby and good things to be doing, it’s all gratefully received and anything that means more sleep etc. is ideal. Feel free to make helpful suggestions via the comments section. Through the summer we have had some nice weather and also many nice customers (as usual). Having been open for a year and a half now we are seeing more and more repeat visitors which is nice too. One guy travelled all the way down from the Shetland Islands for 4 tyres which was a good story – he was a good bloke too. Bryan said “I don’t reckon this guys turning up for them 4 tyres you ordered”, I replied “Howay Bry he’s coming from Shetalnd give him a chance !”. He turned up which was great, he was in Durham buying scale parts for a model railway he has up there. I love this wierd stuff. We also had the pleasure of meeting the Langfords this summer who give us a 1st class write up on google reviews (check it out ! ), reckoned we saved their lives and then topped it all off by dropping wine in for us ! We did some workshop re-configuration also in the summer months adding 2 new ramps and getting rid of a ramp too. The guys who turned up for the ramp we took out were a little bit ‘interesting’ to say the least. Bryan nicknamed their leader ‘Busta Bloodvessel’ from Bad Manners – His idea was to cut a hole out of the roof of the garage and lift the ramp out with crane, this still makes me giggle now to think of how bad this idea was. One saturday morning they spent 6 hours trying to use brute force to extract the ramp and failed. In the end I got my own ramp guy to turn up and remove it, it took him about an hour on his own ! When dad gets home at half 6 the baby just wants to chew his hand ! Anyhow in the old ramps place is a gleaming new 4 tonne 2 post ramp that Steve has been asking for, for about 12 months ! We have another new starter Kevin Davidson who’s pretty handy to have around the place, reckons he’s got magic fingers. One customer asked him if he was my younger brother…hang on a minute comments like that could mean an increase in your bill ! During October and November we’re running our servicing and MOT specials which are always popular. We are still using leading synthetic oils with Petronas at the forefront as well as the VAG LL3 which now goes in a lot of the modern VW, Audi and Skoda Models. I’m also getting tuned back in for winter tyres. We already have lots in stock…too many maybe Bryan is probably thinking ! I plan on doing some winter tyre musings soon if the baby will go to sleep….